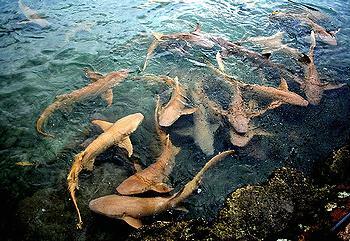 MAJURO, Marshall Islands, October 7, 2011 (ENS) – The Republic of the Marshall Islands has established the world’s largest shark sanctuary. The Nitijela, the Marshallese parliament, unanimously passed legislation this week that ends commercial fishing of sharks in all 768,547 square miles (nearly two million square kilometers) of the Pacific island nation’s waters. 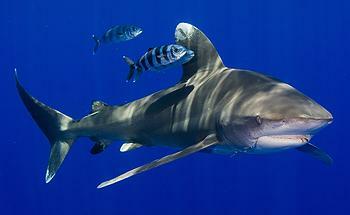 The law bans the sale, trade and possession of sharks, shark fins, or any other shark parts. “In passing this bill, there is no greater statement we can make about the importance of sharks to our culture, environment and economy,” said Senator Tony deBrum, a representative from Kwajalein Atoll, who is a bill cosponsor. The International Union for the Conservation of Nature’s Red List of Threatened Species shows that 30 percent of the world’s shark and ray species are threatened or near-threatened with extinction. Some species, such as the white tip shark and the scalloped hammerhead shark, have lost more than 98 percent of their numbers to industrial fishing over the past 60 years. Up to 73 million sharks are killed annually to support the global shark fin trade, according to the Pew Environment Group, which is fostering efforts to establish shark sanctuaries, where targeted fishing for these species is prohibited. The worldwide demand for shark fins, meat, liver oil, and other products has driven numerous shark populations to the brink of extinction. Shark fins are in great demand for the Asian delicacy, shark fin soup – a bowl of shark fin soup can cost up to US$100. One kilogram (2.2 pounds) of shark fins can sell for as much as US$700, according to the Pew Environment Group, which is spearheading efforts to establish shark sanctuaries, where targeted fishing for these species is prohibited. Because they grow slowly, come to maturity late in life and produce few young, sharks are vulnerable to overfishing and populations are slow to recover once depleted. The new Marshall Islands’ law imposes a complete prohibition on the commercial fishing of all species of sharks as well as the sale of any sharks or shark products. Under the law, any shark caught accidentally by fishing vessels must be released. The law stipulates large monetary fines, anywhere between US$25,000 to US$200,000, for anyone who is found to be fishing for sharks or in possession of shark fins. In addition, violators would be fined the market value of the product in their possession. The law places a ban on the use of wire leaders, a longline fishing gear which is among the most lethal to sharks. A monitoring and enforcement provision requires all fishing vessels to land their catch at one of the country’s ports and bans transfers at sea. “We salute the Republic of the Marshall Islands for enacting the strongest legislation to protect sharks that we have seen,” said Matt Rand, director of global shark conservation for the Pew Environment Group. “As leaders recognize the importance of healthy shark populations to our oceans, the momentum for protecting these animals continues to spread across the globe,” said Rand. This week’s action is the culmination of developments that began in March when the Marshall Islands Marine Resources Authority issued a moratorium on the shark trade. It was furthered in June, when President Jurelang Zedkaia joined other central Pacific leaders in setting the stage for the creation of a Micronesia Regional Shark Sanctuary, the first regional shark conservation agreement of its kind. In July, the Marshall Islands Mayors Association moved to make this vision a reality by passing a resolution that called on the 24 inhabited atolls throughout the Marshalls, each with its own local government, to enact ordinances prohibiting the sale and trade of sharks or shark fins. Following public hearings last month, the Nitijela’s Resources and Development Committee, chaired by Namu Senator Kaiboke Kabua, decided to insert shark protection language into the fisheries Bill 100. While Bill 100 had some shark protections, it also had some loopholes, which have now been closed. The Republic of the Marshall Islands has a Compact of Free Association with the United States government. The Compact, which entered into force in 1986, granted the RMI sovereignty in domestic and foreign affairs in return for granting the United States defense rights in the islands. Some 67,000 people live in the Marshall Islands, approximately 1,225 islets in 29 low-lying atolls scattered across 768,000 square miles of the central Pacific Ocean.